1. 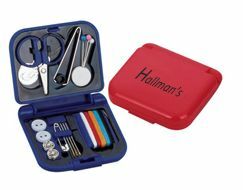 To get your FREE Travel Sewing Kit from Hallmanstailor.com, Click to Redeem. 2. Fill in the form with complete details. 3. Pick a sewing kit color. 5. Your Free Travel Sewing Kit should arrive in four to six weeks!